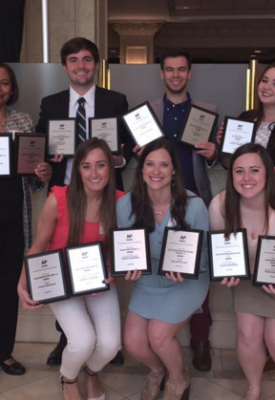 University of Mississippi journalism students working in newspaper, television and radio won more than 50 awards in three separate regional contests this spring. The Daily Mississippian, led by Editor-in-Chief Clara Turnage and advised by Patricia Thompson, assistant dean for student media in the Meek School of Journalism and New Media, was named best daily newspaper in the Society of Professional Journalists Region 12, competing against college newspapers at the largest universities in Mississippi, Arkansas, Tennessee and Louisiana. NewsWatch Ole Miss, under the leadership of station manager Payton Green advised by journalism professor Nancy DuPont, won first place for best newscast. The Daily Mississippian and NewsWatch will compete against winners in the other 11 regions for national titles. National winners will be announced later this month. The Daily Mississippian won first place for public service in the “Best of the South” awards at the Southeast Journalism Conference for its “Red Zone” special section focused on sexual assault issues, published Oct. 27, 2016. The SEJC includes competitors from more than 40 universities in seven Southeastern states and was hosted on the Ole Miss campus this year. The DM won numerous first-place awards at the Mississippi-Louisiana Associated Press contest as well, including general excellence, breaking/spot news and for its website. NewsWatch also won a first-place award in this contest for best sportscast. Several students, including Turnage, took home individual awards. The senior from New Hebron was honored with eight awards in three contests, including first-place honors for feature writing, general news reporting and enterprise-investigative reporting. She won a newspaper “Best of Show” award from the Associated Press and finished second in SEJC’s prestigious College Journalist of the Year competition. Turnage said she is thankful for her time at the DM. “This has been an incredible year,” she said. “I’ve dreamed of being editor-in-chief since I came to Ole Miss and it was everything I wanted it to be. Turnage has accepted a summer internship with the Chronicle of Higher Education in Washington, D.C. She is among only three interns hired, along with a student from UC-Berkeley and another from Columbia University. The UM journalism school’s advanced reporting and television documentary classes also were honored with a first-place award from the AP for Best Student Documentary. Led by journalism professors Brad Schultz and Kathleen Wickam, the classes produced a half-hour documentary titled “Mississippi Votes: Looking Back, Moving Forward,” focused on Mississippi’s role in the 2016 general election, specifically in regards to voter identification, immigration and young voters. The documentary can be seen at https://www.youtube.com/watch?v=7-jVde3h8oQ. “Mississippi Miracle,” a depth report about the Mississippi Band of Choctaw Indians, was named a finalist in the SPJ contest. The report was produced by student journalists in a class led by instructor Bill Rose, assistant professor Mikki Harris and instructor Emily Bowen-Moore.